The bankruptcy code at 11 USC 104 provides for the periodic adjustments of certain dollar figures in the bankruptcy code every 3 years to account for inflation. The next set of new figures will be effective April 1, 2013. Closer to that date, the courts will publish an official list of changes. However, the Consumer Price Index data needed for the adjustment is now available, so it is possible to predict what these adjustments will be. Based on my review of the CPI data, I believe the inflator value of 1.063 will be applicable to the Section 104 calculations. This is somewhat more modest then the 1.070 inflator of 2010 and 1.095 inflator of 2007, but is to be expected given the economic conditions of late. Once an inflator is determined, the dollar adjustments can be calculated. I'll start by discussing a few that I believe are particularly relevant, and then at the end include a table of predicted changes. While a 6.3% increase is not particularly large, the numbers to be adjusted are occasionally very consequential in bankruptcy cases. Debtors on the margin might find a small change very significant. Please note that the numbers in this post are the product of one attorney's predicted calculation, and should not be used in place of the official numbers, which will be released in coming weeks. Section 109(e) of the bankruptcy code limits the eligibility of people to file chapter 13 bankruptcy based on amount of debt. Based on the predicted inflation value, the limit on noncontingent liquidated unsecured debt would increase from $360,475 to $383,175, and the limit on noncontingent liquidated secured debt would increase from $1,081,400 to $1,149,525. The debt limits come up with some frequency, and at times are a harsh cut-off from cost-effective reorganization under chapter 13. The means test controls chapter 7 eligibility by providing a grounds to dismiss chapter 7 cases that fail the test and are "presumed abusive." In chapter 7, a case is "presumed abusive" if, after applying statutorily allowed deductions, too much income remains. Whether or not the income after deductions is too much is determined by comparison to two statutory thresholds, both of which are scheduled to be increased by the April 1 adjustments. Based on my calculations, one threshold would increase from $11,725 to $12,475 and the other from $7,025 to $7,425. For debtors with at least $50,000 in unsecured debt, this amounts to a increase in $12.50 per month in income that would not trigger means testing eligibility issues. Practically speaking, such a fairly modest change and not any more consequential than the semi-annual means testing adjustments. The means test only applies if a debtor is above the median income for his or her household size. While household sizes of 1 to 4 use actual statistical data, households "medians" for household sizes of 5 and more are calculated by adding a statutory amount to the UST published statistic for a household of four. This monthly statutory figure is likely to increase from $625 to $675. The consequence is that annual medians for households of 5 would increase by $600; households of 6 by $1,200, households of 7 by $1,800, and so forth. Section 522(d) creates the so-called "federal exemptions" which certain debtors claim to protect their assets in bankruptcy. Some states allow their residents to choose the federal exemptions, while others, including North Carolina, do not. Most NC residents will use the NC statutory exemptions, not the 522(d) federal exemptions. The exception is certain cases where the debtor has moved to North Carolina from particular states within the two years prior to filing the bankruptcy case. Many of the 522(d) federal exemptions are limited to a certain dollar amount of property. Each of these limits will increase on April 1, 2013 with the inflation adjustment. Applying my 6.3% estimate, changes would include an increase in the homestead exemption from $21,625 to $22,975 and the motor vehicle exemption from $3,450 to $3,675, for example (see also full table below). If a creditor proves a particular debt was obtained by false pretenses or fraud in a dischargability adversary proceeding, the debt is not discharged and survives the bankruptcy. The creditor has an easier case when one of two situations exist and fraud is presumed: (1) purchases of luxury goods totaling more than $600 in the 90 days prior to bankruptcy and (2) certain cash advances totaling $875 in the 70 days prior to bankruptcy. Both of these figures will be adjusted, to $650 and $925 respectively based on my predictions. Update 2/21/2013: The official numbers have been posted to the federal register, and are as predicted in this post. 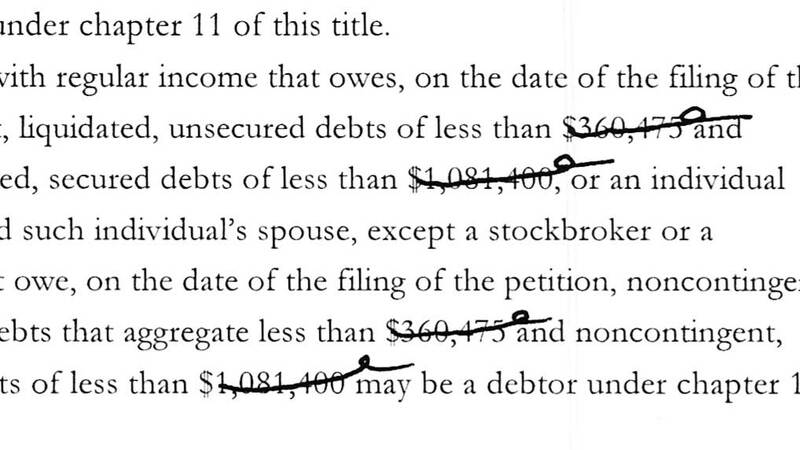 Requirement of 11 USC 109(e) concerning the maximum debt of a chapter 13 debtor. As of April 2010, this was $360,475 unsecured debt and $1,081,400 secured debt. These limits only apply to noncontingent liquidated debts, and are periodically adjusted for inflation. Under the 2005 bankruptcy law, a statutory means test is used to determine what income the debtor should devote to repaying debts. Applicable both to chapter 7 and chapter 13, the means test first compares a debtor's household gross income to the North Carolina median, and if above that median, then applies series of expense allowances loosely associated with the debtor's actual expenses.